Donald Trump’s former attorney, Michael Cohen, is a flawed man with nothing left to lose, charting a path to redemption by finally coming clean about crimes and misdeeds allegedly committed by the president of the United States. Either that, or he’s a cheat and a crook who can’t be trusted, who’s already pleaded guilty to lying to Congress and isn’t above doing it again if it’ll help him land a book deal. These are the two interpretations of Cohen’s hearing before the House Oversight Committee that manifested online Wednesday. As they’ve done so many times before—during the Benghazi investigation, during Supreme Court Justice Brett Kavanaugh’s hearings—the internet’s tribal factions retreated to their corners over the course of the day to tell utterly opposite stories about the much-anticipated hearings and what they revealed about Cohen and Trump. On social media and on partisan sites, the conversation split into like-minded echo chambers, with each side parroting the talking points of their party’s members who were sitting in the hearing room. What emerged was a sort of cacophonous bizarro world that would have seemed implausible just a year ago: Conservative pundits and political operatives, including Trump’s own children, worked overtime to discredit a man who spent 10 years as a close confidante to Trump, and until last June, served as deputy finance chair of the Republican National Committee. Liberals, meanwhile, spent their 240 characters sticking up for and even applauding the humility of a man who’ll head to prison in May for, among other things, lying to Congress to defend Trump and making hush money payments on his behalf. In a world of divergent media diets and carefully curated filter bubbles, just which story you heard depends mostly on your timeline. Liberal Twitter woke up Wednesday to an avalanche of stories about Cohen’s core arguments. In his opening testimony, which was reported by several media outlets before the hearing began, Cohen called Trump “a racist,” “a con man,” and “a cheat” who knew as early as July of 2016 that Wikileaks was planning “a massive dump of emails that would damage Hillary Clinton’s campaign.” Cohen stated that, while serving as president, Trump personally signed a check to reimburse Cohen for hush money payments he made to women who said they’d had affairs with Trump, and that Trump once challenged Cohen to name a single country run by a black person that isn’t a “shithole.” In his remarks, Cohen painted Trump as a petty tyrant, who had Cohen threaten a high school to prevent it from leaking the future president’s grades and SAT scores and who once enlisted a bidder to buy a portrait of Trump at an auction, only to repay the bidder out of his charity’s funds. Both voices on the left and mainstream outlets like The New York Times, CNN, and WIRED seized on these accusations as the focal point of the day. This was, after all, the evidence that Cohen had been called on to present. 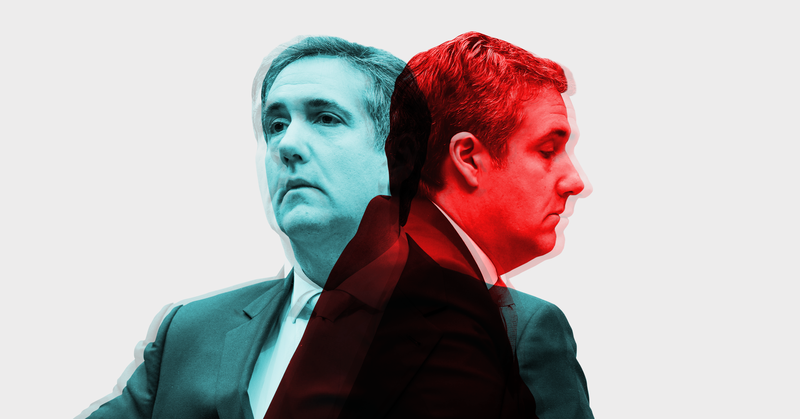 And, as WIRED contributor Garrett Graff pointed out, despite Cohen’s history of lies, he had come to Congress armed with receipts in the form of checks and other documentation that backed up much of his testimony. Meanwhile, on Twitter, prominent conservatives and liberals traded whiplash-inducing barbs. Republican National Committee chairwoman Ronna McDaniel tweeted that inviting someone to testify who had lied to Congress before amounted to a “charade” by Democrats. The Democratic National Committee responded by reminding McDaniel that Cohen told those lies to protect Trump. Other voices on the right opted not to pick apart Cohen’s claims or his credibility, but instead attacked Democrats in the House for distracting from Trump’s meeting in Vietnam with North Korean leader Kim Jong Un. Of course, on the other end of the ideological spectrum, Trump’s meeting with Kim wasn’t so much seen as an attempt at negotiating peace as it was yet another example of Trump kissing up to a ruthless dictator. At times, sticking to the script posed a challenge for conservatives, who both wanted to undermine Cohen’s testimony and use it to their advantage. The Daily Caller, which repeatedly cast Cohen as a liar, also wrote a story about how Cohen “put a dagger in the heart” of the Steele dossier, a document that alleged a range of misdeeds by Trump and claimed that Cohen had traveled to Prague to meet with Russian operatives during the election. In his testimony, Cohen stated, as he has in the past, that he’d never been to Prague. This was one of the few tidbits from the hearing—an uncorroborated one, at that—which voices on the right accepted as fact. It was hardly the first time we’ve seen such a divide in the public discourse. It will hardly be the last. But Cohen’s hearing does provide a window into what’s to come. Cohen’s new and explosive allegations against the president on Wednesday did little to stir the country’s warring political factions from their entrenched positions. Neither have months of indictments by special counsel Robert Mueller’s office, which have ensnared not only Cohen but also Trump’s former campaign chairman Paul Manafort and his longtime consultant Roger Stone, among others. Watching the reaction to these mounting scandals play out online, it’s hard not to wonder: If Mueller’s final report ever does see the light of day, what will it even accomplish? In his closing remarks, committee chairman Rep. Elijah Cummings, the Democrat from Maryland, delivered an impassioned address, briefly bringing Cohen to tears and urging a return to normalcy in politics. “When we are dancing with the angels,” Cummings said, “the question will be asked: In 2019, what did we do to keep our democracy intact? Did we stand on the sidelines and say nothing?” For many, the answer may be closer to this: We stood on the sidelines and tweeted.